Monkey Shoulder scotch: one of the best blends available, on its own or in a Prince Edward cocktail. Monkey Shoulder is one of my go-to scotches. As you can see from the picture, I go through this stuff pretty quickly. When I want to have a dram in the evening, this is the scotch I grab. When I want to make a Blood and Sand, this is my scotch. Why is it your scotch? First, because it’s good. It’s a blend of three single malts: Glenfiddich, Balvenie and Kininvie aged for three to six months in first use ex-bourbon casks. I’m not familiar with Kininvie, but Glenfiddich and Balvenie are both great, so it’s no coincidence that they make for a great blend. 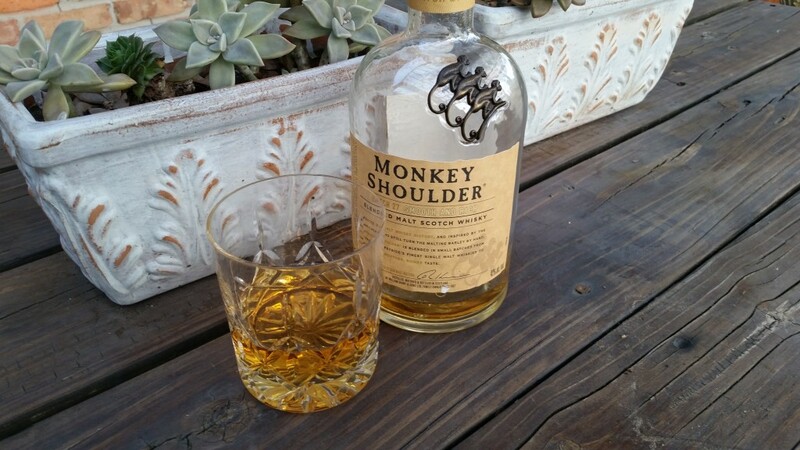 On its own, Monkey Shoulder is sweet and a bit spicy. Not spicy like rye, but a bit spicy with alcohol. It’s not a bad burn, though. Overall, it’s smooth, especially on ice. This one, I can drink either way, though. Sometimes I want the alcohol burn, but other times, I want it more mellow, and ice makes it happen. The smell is vanilla and apricot and banana, and the taste is butterscotch. It’s utterly drinkable. Besides being a good scotch, it also has a great name. It’s called Monkey Shoulder because that’s the name they would give to people who turned the barley by hand. They would use the shovel so long that the right arm would begin to hang lower, and they called the condition monkey shoulder. That’s hilarious. Third, besides being a decent scotch and having a great name, this stuff is cheap. It’s about $33 a bottle at my local Spec’s. That’s a damn good deal for such a damn good scotch. It’s not the main reason to drink a spirit, but it helps. If it’s good and it’s cheap, why not? How is it in cocktails? But Monkey Shoulder makes great cocktails, too. As I mentioned, it’s great in a Blood and Sand, but my favorite is the Prince Edward cocktail. stir well, and strain into a chilled cocktail glass. I like to rub a lemon peel around the rim, too. Drop it in or not. Doesn’t matter. Drambuie is strong stuff, and it doesn’t overpower here. I used to love Drambuie, but my palette has moved beyond such sweet stuff, so I use it very sparingly now. This drink is perfect. Compared to a 1:1 or even a 1:2 Rusty Nail, this one has just a bit of Drambuie compared to the rest of the ingredients. It’s sweet, but more like the sweetness of a Manhattan. Right behind the Blood and Sand, this is my favorite scotch cocktail.